Traumatic impact from a motor vehicle crash is one of the leading causes of an SCI. Other common causes of spinal cord injuries include construction accidents, sporting accidents, fall accidents, and other traumatic accidents. The spinal cord doesn’t have to be severed for loss of mobility or other functions to occur. Many people with an SCI have a spinal cord that is intact but there has been damage to the spine or the vertebrae around it. People suffering from an SCI will often have to contend with lifelong physical and financial losses. Medical expenses, a lesser quality of life, and other negative consequences may burden the patient and his or her family. Our San Diego SCI lawyers are committed to helping our spinal cord injury clients receive the maximum recovery from the negligent entity or individual. A person with a spinal cord injury may experience impaired movement, chronic pain, and ongoing weaknesses in the arms, legs, or hands. 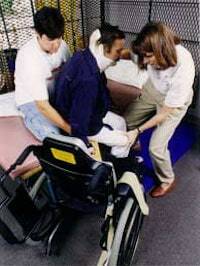 An SCI client usually will have costly bills for medical care; rehabilitative care costs, and home modifications to allow for greater accessibility, transportation expenses, such as specially outfitted vans, wheelchairs, and home access ramps, as well as other quality of life challenges. If you or someone you love is suffering from a spinal cord injury caused by the carelessness, negligence, or wrongful actions of another party, you may be able to receive compensation for your losses. It is very important that you hire a San Diego spine injury lawyer that can properly investigate your case and knows how to develop a courtroom presentation that is effective so that you can get the financial recovery that you need to move forward. You need an SCI attorney with access to specialized medical and rehabilitation experts that can give an insurance company or jury a full picture of the present impact of your injuries and the physical difficulties you may have to deal with for the rest of your life. The Law Offices of David M. Boertje handles all San Diego spinal cord injury claims and lawsuits on a contingency basis. Our clients never pay us in advance, and we are only compensated for our services if we obtain your settlement or judgment. When we do obtain your financial recovery, our fee is an agreed upon percentage of this amount. Payment to our San Diego law firm is only upon the successful conclusion of your case. All prospective clients are invited to contact our SCI lawyers for a free initial consultation. We are experienced San Diego spinal cord injury attorneys at the Law Offices of David M. Boertje, and we will make sure that you understand what your prospects are for a successful case outcome and are fully informed about your legal rights. Many of our SCI clients were injured in cities throughout San Diego County, including Carlsbad and San Diego. To request your FREE CONSULTATION with an experienced spinal cord injury attorney or to discuss another kind of personal injury case, call us, send us an e-mail, or contact us online. We will get in touch with you as soon as possible.